A team full of players not named Zetterberg or Datsyuk that has had significant trouble finding the back of the net early on this season, due to disappointing starts by multiple free agent signings, answered many fans' prayers today by inserting Gustav Nyquist into the lineup for Thursday night's game against the Carolina Hurricanes. Nyquist impressed many fans during last year's playoff run. Playing on Detroit's 3rd line, Nyquist provided a shot of energy and puck-handling skills into the lineup, making Detroit a deeper team. The experience seemed invaluable for Nyquist who began the year in the AHL due to a logjam of forwards and limited cap space available in Detroit. In 15 games thus far in Grand Rapids, Nyquist has buried 7 goals and added 14 assists. 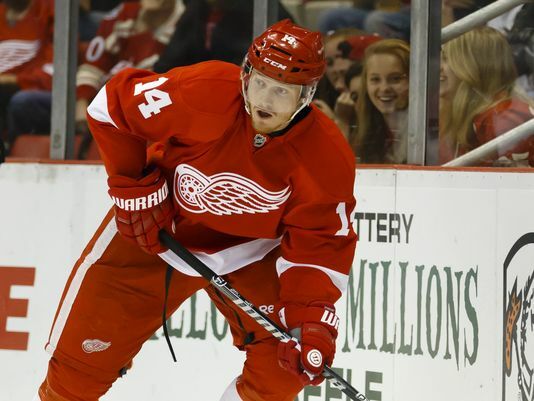 It remains to be seen how much impact Nyquist will have early on, but the prospects are high. He's slated to begin the night playing RW on a line with Henrik Zetterberg and Johan Franzen. The combination of Zetterberg's ability to find an open line-mate, his steady point production and Franzen's resurgence since coming back from injury (3 G, 2 A in 4 games) make Nyquist an intriguing fantasy option for anyone looking for help. Another fact to keep an eye on, if Nyquist plays just two more NHL games he must clear waivers if the Wings send him back to the AHL. The Wings will not chance losing Nyquist in that manner, making him a valuable and sneaky pick if he sticks with the big club. If he slides in and starts producing, he will stay in the NHL.